In United States, the number of people choosing their career in the healthcare field is increasing day by day. Massachusetts ranks fifth among the top paying states in the USA for this profession. The figures provided by the Bureau of Labor Statistics show that 40,980 nursing assistants were employed in the state, as on May 2013. The mean annual and hourly salary was recorded to be $30,010 and $14.43 respectively. As per the data provided by indeed.com, the average income, in December 2014, was $29,000. The employment per 1000 jobs was 12.58. The average CNA income for job postings was 20 percent higher in Massachusetts than CNA salaries throughout the nation. 90% of CNAs made less than $38,330; 10% made more than $38,330. 75% of certified nurse assistants offered less than $34,270; the remaining 25% were paid more than $34,270. 50% of the employees were waged less than $29,070; the rest 50% were provided more than $29,070. 25% of CNAs were paid annual wages less than $25,580; 75% received more than $25,580. 10% of employees were salaried less than $22,290; 90% were salaried more than $22,290. Geographical location is considered a prime factor when it comes to deciding the salary of a nursing assistant. As per the following table, it is clear that Arlington, Boston, Brockton, Brookline, Cambridge, Framingham, Lowell, Lynn, Malden, Medford, Newton, Peabody, Plymouth, Quincy, Revere, Salem, Somerville, Waltham, Taunton and Weymouth were the highest paying cities of MA with an annual pay of $33,154 and median monthly and hourly wages are $2,763 and $16 respectively (as of December 2014). Pittsfield was the lowest paying city which provided a median annual salary of $31,533. 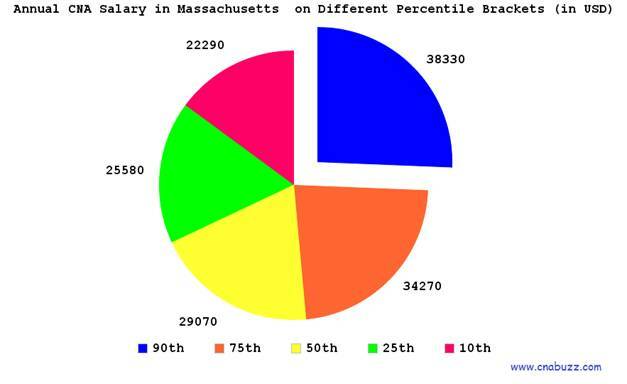 The median hourly salary of almost all the cities in MA is $16. The following table shows the average yearly, monthly and hourly salaries of CNAs in different cities of Massachusetts. Different job titles are given to the nursing assistants according to their education level and their nursing experience. According to indeed.com (as on December 2014), CNA Hospice earned the highest, i.e., $38,000 while Correctional Prison Facility CNA were paid the lowest, i.e., $18,000. Looking at the increasing demand of nursing assistants, the job opportunities are also predicted to rise in the upcoming years, as per the data of Bureau of Labor Statistics. The job prospects of CNAs are expected to grow by 21%. Home health services and community rehabilitation services are supposed to provide the best job opportunities since the funding provided by the government will lead to lesser demand for the nursing assistants at nursing homes. Question 1 – I’m planning to move from Lynn to Boston. Is there any change in the hourly salary of a CNA? Answer – No, both the cities provide the same hourly salary i.e. $16. Question 2 – Can anyone suggest me the highest paying job title and the salary offered to them? Answer – In Massachusetts, CNA Hospice is the highest paid job title with an average salary of $38,000 as per the figures provided by indeed.com.